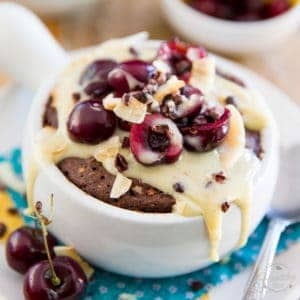 But I always resisted the temptation, first and foremost because I wanted to keep my recipes accessible and thought that most people out there did not own a Vitamix and therefore wouldn’t be able to duplicate the creations that I’d eventually come up with while using it. My second biggest reason for not getting one was the financial investment that it implied. I couldn’t possibly justify spending that kind of money on a high-speed blender when I already had one of the standard model, which worked perfectly well and had been serving me flawlessly for the last 15 years. But then something terrible happened. My mom just casually called me up one day and went “Guess what I got today? A brand new Vitamix! Whoa, what a machiiiiiiiiine…” And then she went on and on praising the virtues of her new acquisition. All the while, I was turning WAY green with envy. I’m sure you’ll all guess what happened next… Of course, I asked if maaaaybe I could perhaps possibly borrow it one day and try it for myself, you know, just so I could see what the hype was all about. 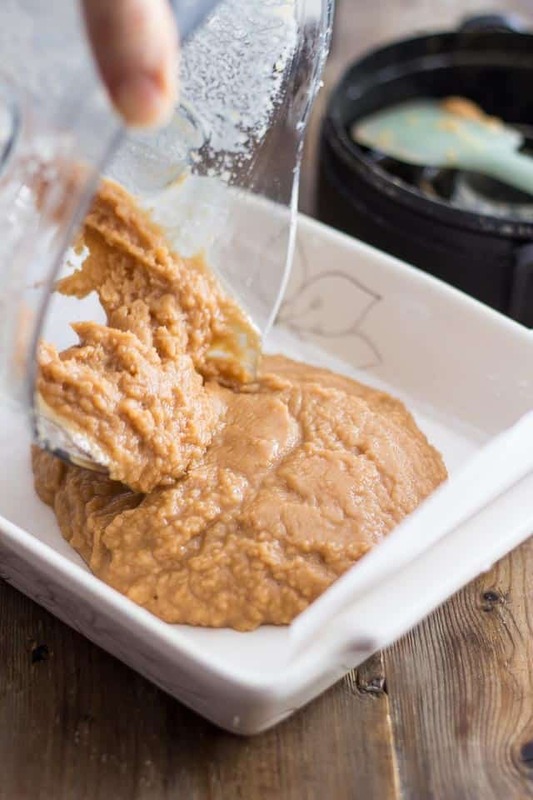 And so the experimentation began… loads of different kinds of nut butters were created; that and coconut butter, of course! And then this surreal, insanely crazy Paleo Toasted Coconut Fudge came into existence. That was it. I was hooked, done for… Right then and there, I knew that my life would never be complete until I got me one of those machines. 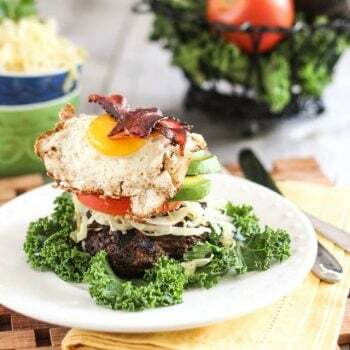 Its flavor is absolutely divine for anyone who is a fan of toasted coconut, and its texture is even more perfect, if you ask me. Melt-in-your-mouth creamy but still firm enough that it holds its shape well and offers a little bit of resistance when you bite into it. 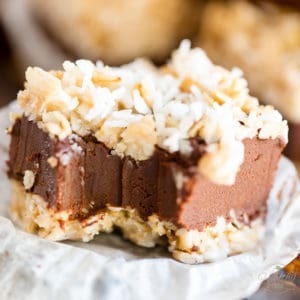 Frankly, these Coconut Fudge Squares are something that simply need to be experienced. 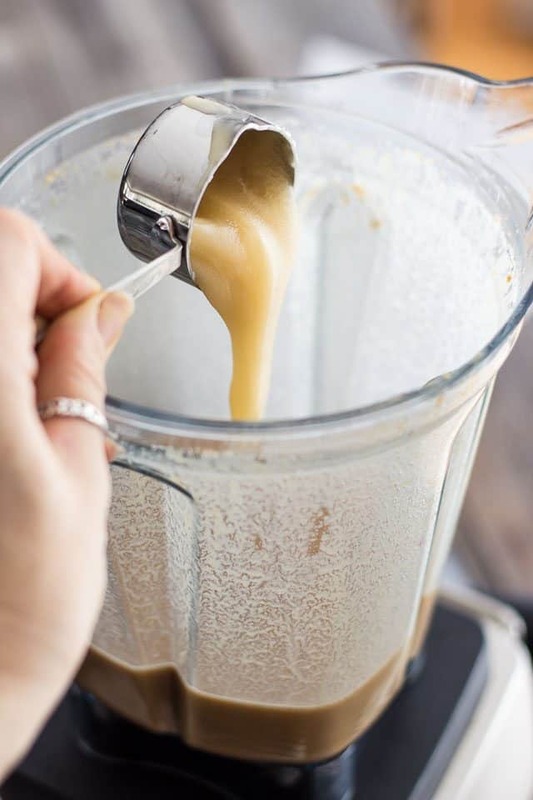 Sadly, though, to really get that texture right, you absolutely need to use a high speed blender such as the Vitamix. 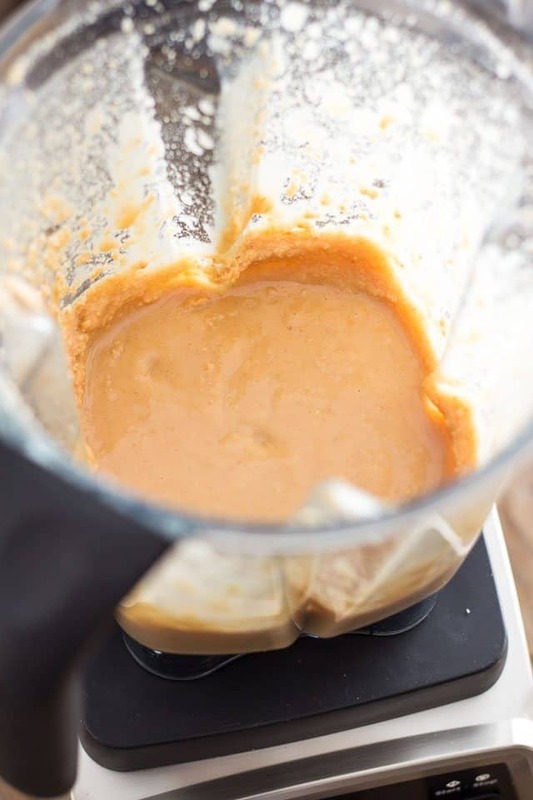 A regular food processor or blender simply won’t cut it. As an alternative, I suppose you *could* always try and use this technique to get the coconut butter ultra creamy before you add the rest of the ingredients, but I suspect the final result won’t be nearly as spectacular. Before you do anything, you’ll need to grease a 6” x 6” Square Pan with coconut oil and then line it with parchment paper. 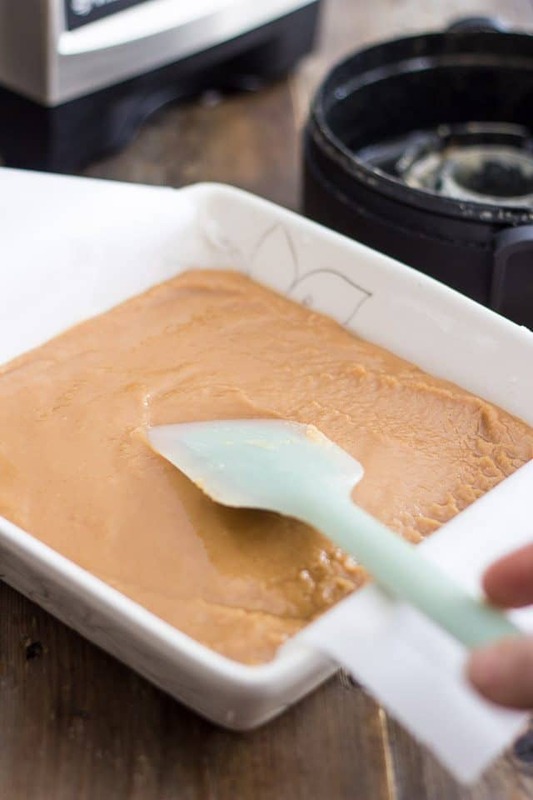 Leave a bit of an overhang at either end so you can unmold your fudge super easily once it’s set. 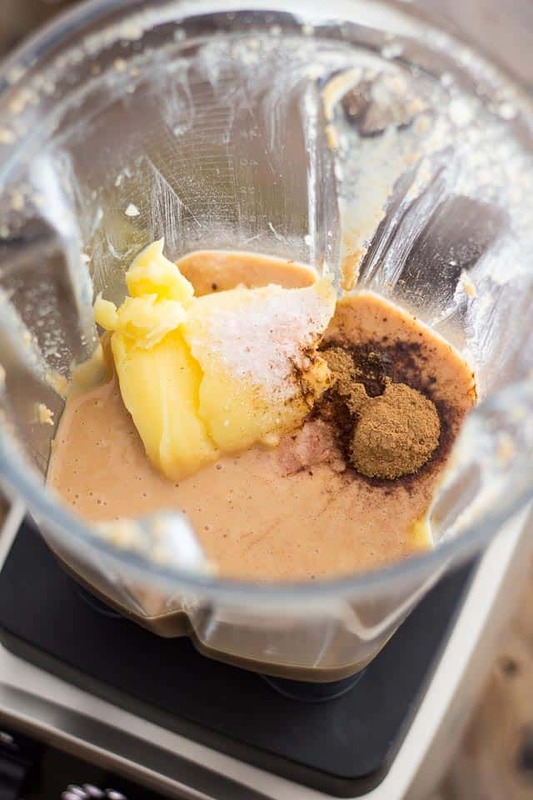 Now add the toasted coconut to your high speed blender and process it on medium speed for about 30 seconds to a minute, then slowly increase the speed all the way up to the highest setting. Keep processing until the coconut flakes turn into a thick paste, which shouldn’t take much more than 45 seconds to a minute. I bet you won’t even need to stop to scrape the sides either, not even once… I know I didn’t! Remove the lid and stick your nose in there. Take a nice long whiff or two and then scrape the sides with a rubber spatula just to make sure we have every last bit of coconut in there. Add the ghee, salt, cinnamon and almond extract. 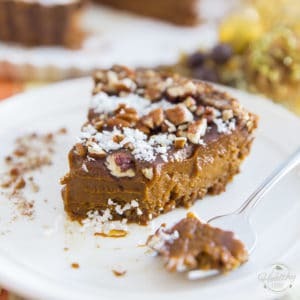 Note that the almond extract isn’t absolutely necessary, but it imparts such a lovely flavor to the fudge, I personally would’t leave it out. Resume processing, starting on low again and increasing all the way up to the highest setting, until the mixture becomes super smooth and fairly liquid in consistency, almost like heavy cream. Now add the honey and start the motor again. Slowly increase the speed to medium-high (variable 6-7) and process until the honey is completely incorporated, about 15 to 20 seconds. A note about the honey: DON’T be tempted to add it early. There’s a reason why it gets incorporated only now: it will INVARIABLY, completely, totally change the consistency of your coconut mixture, rendering it thick and looking kind of “broken”. This IS desirable, but you need to get your coconut to the smooth, liquid stage BEFORE you take it to the next level. See? I wasn’t kidding when I said that the honey would drastically change the consistency of the mixture. That, right here, is perfectly normal and is precisely what you’re looking for. 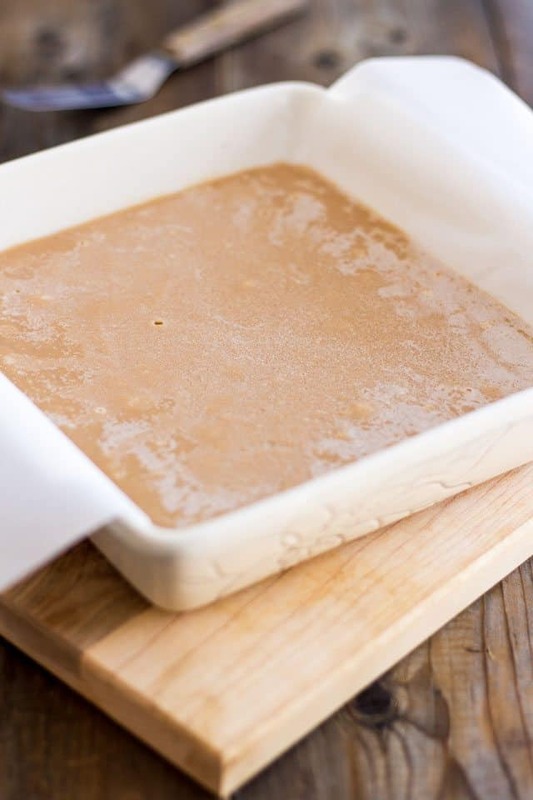 Transfer this thick mixture to your prepared pan and spread it as evenly as possible all the way to the edge. Gently tap the sides a few times to remove any potential air bubbles and also make the top really nice and smooth. And so now begins the waiting game… Your fudge must be placed in the cupboard to set until the next day. Yes, that’s UNTIL THE NEXT DAY! No cheating allowed. Unless *maybe* if you were in a real hurry and really couldn’t wait that long… then I suppose you could probably put it in the fridge for a couple of hours. Oh, and in case you’re wondering, the white film that you see on top is just a little bit of coconut oil that rose to the top while the fudge was setting. Don’t worry about it, since we’ll be flipping this baby over, none of it will show. 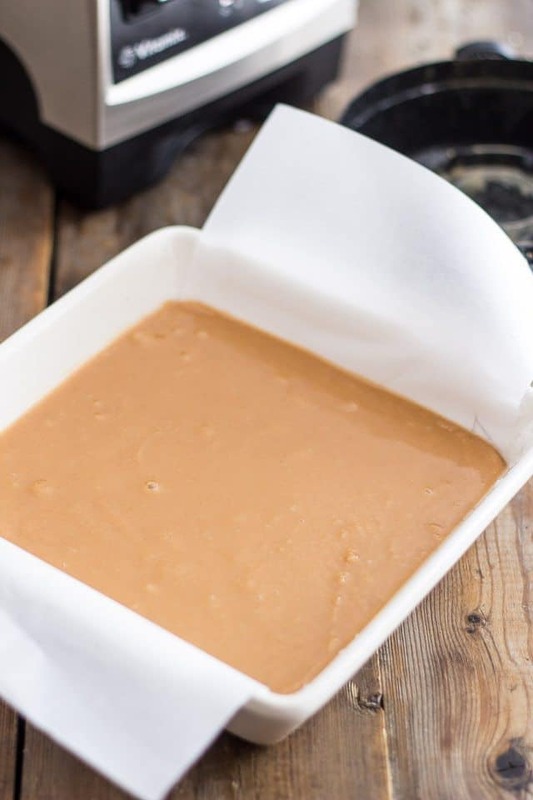 Now that your fudge has had time to set, run a knife or spatula around the sides and then gently pull on the parchment paper to free it from the pan. 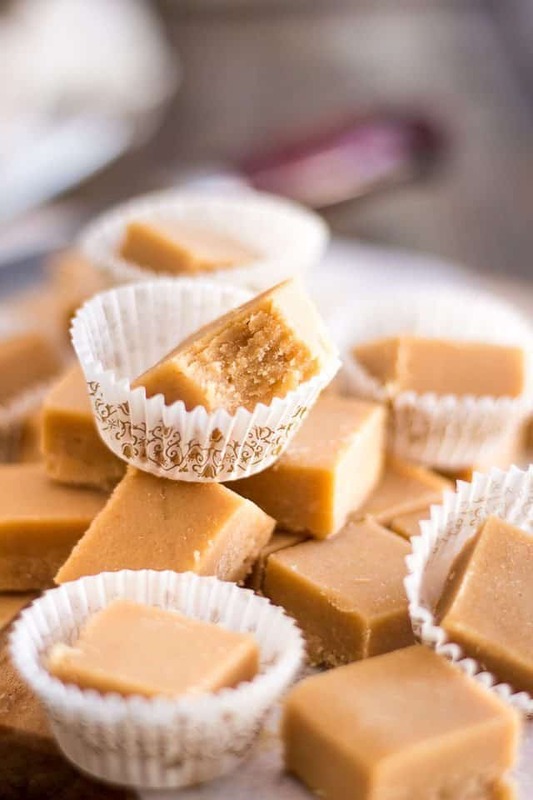 Flip it upside down onto a cutting board and peel off the parchment paper, then lovingly cut your fudge into 36 squares. 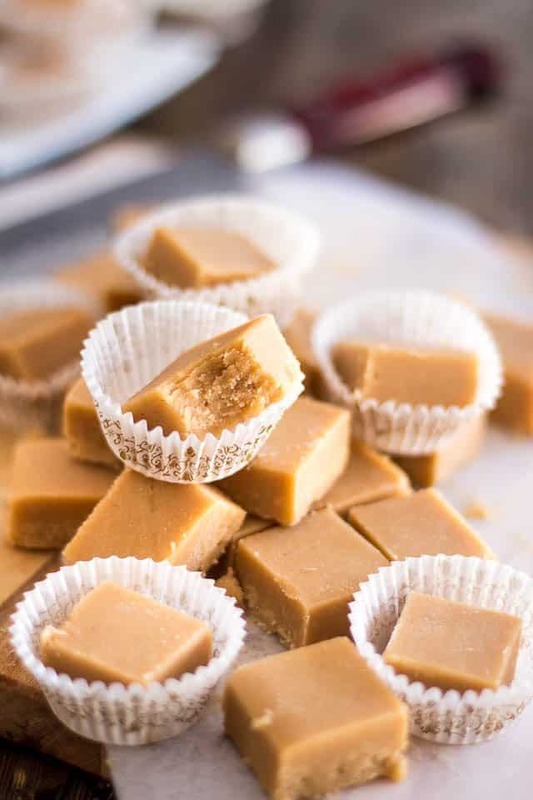 If you’re going to be serving these at a party, or if you’re feeling fancy and want to make your fudge all pretty and dressed up, place each individual square into a cute little paper cup. 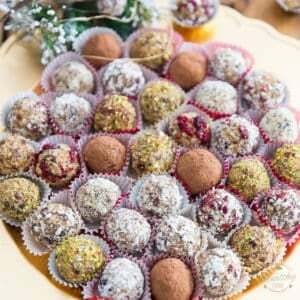 Keep your treats in a cool dry place in an airtight container for up to a few months. <– Yeah right, like that’s gonna happen! During the hot summer months, though, you will definitely have to keep your fudge in the fridge. This IS mainly coconut butter after all, and you know how this stuff melts in the heat like ice cream under the sun! Just check out that texture… can you get a sense of how delicious this would be on your tongue? I know I can, for I have experienced it first hand. And I can tell you it’s pure bliss. And that alone, I believe, is ample justification for me to finally invest in one of those dream machines! 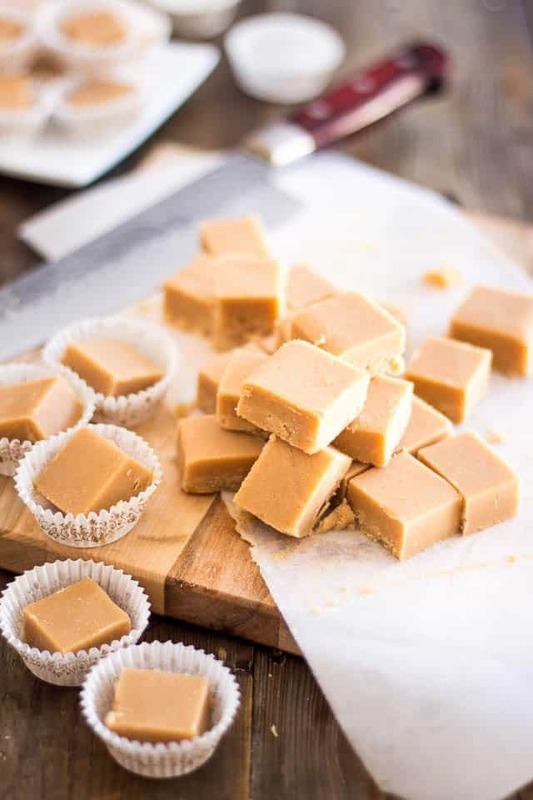 Hey, incredibly delicious fudge without so much as an inch of guilt factor? I say that’s priceless! Grease a 6” x 6” Square Pan with coconut oil and then line it with parchment paper, leaving a bit of an overhang at either end for trouble-free unmolding. 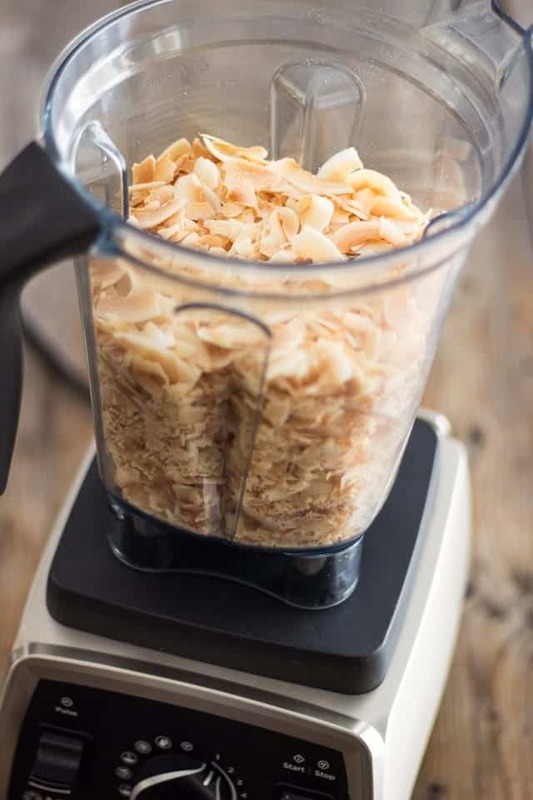 Add the toasted coconut to your high speed blender and process on medium speed for about 30 seconds to a minute, then slowly increase the speed all the way up to the highest setting. Keep processing until the coconut flakes are turned into a thick paste, which shouldn't take much more than 45 seconds to a minute. Remove the lid and scrape the sides with a rubber spatula, then add the ghee, salt, cinnamon and almond extract. Resume processing, starting on low and increasing all the way up to the highest setting, until the mixture becomes super smooth and fairly liquid in consistency, almost like heavy cream. Add the honey and start the motor again. Increase speed to medium-high and process until the honey is completely incorporated, about 15-20 seconds. 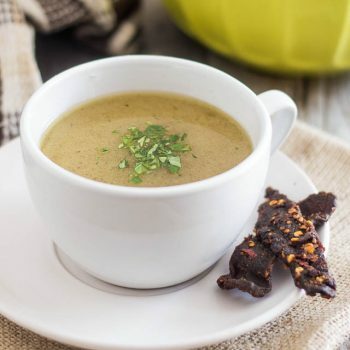 You’ll notice a drastic change in consistency: the mixture will become a lot thicker and will look almost broken up. That’s perfectly normal and it’s exactly what we’re after. Transfer this mixture to your prepared pan and spread it as evenly as possible all the way to the edge. Gently tap the sides a few times to remove any potential air bubbles and make the top really nice and smooth. Place this in the cupboard to set until the next day. 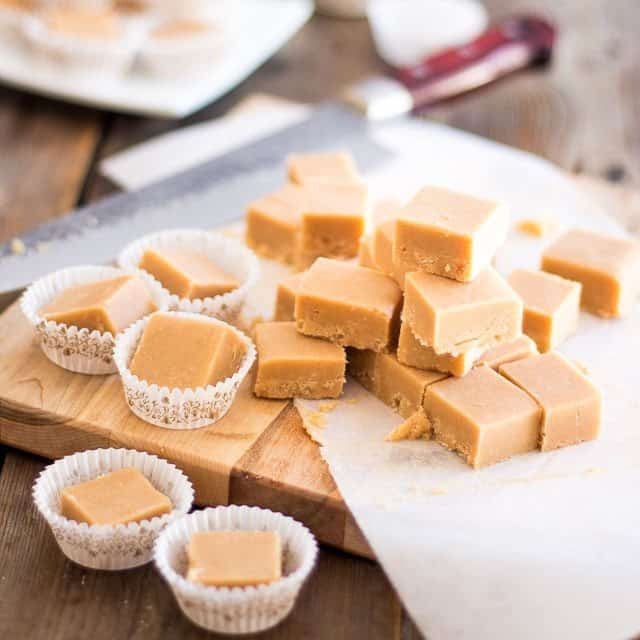 Run a knife or spatula around the sides and then gently pull on the parchment paper to remove your fudge from the pan. Turn it upside down onto a cutting board and peel off the parchment paper. 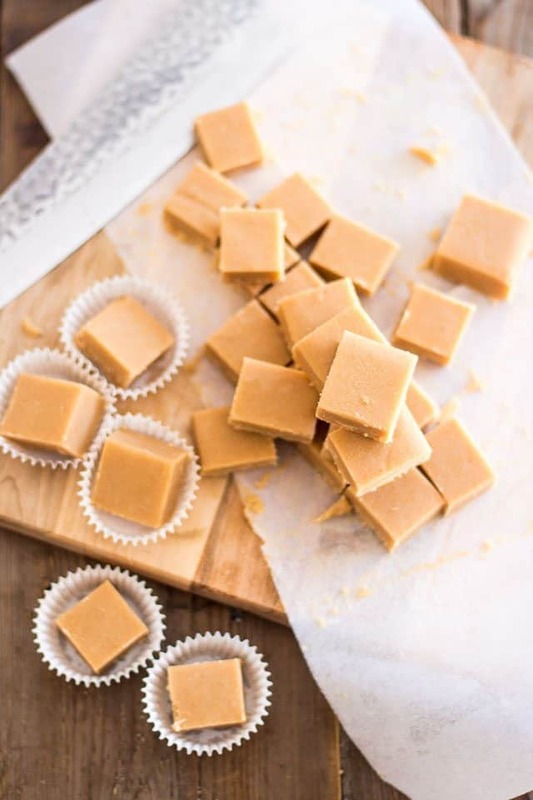 Delicately cut your fudge into 36 squares. 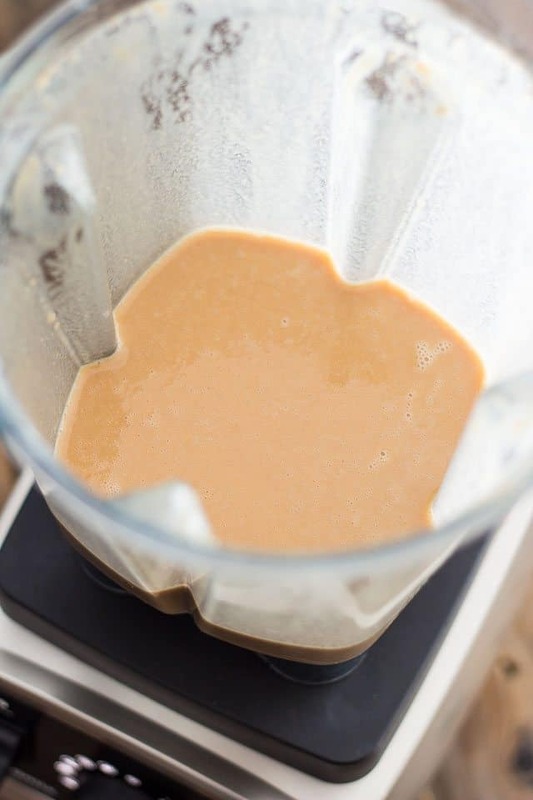 If you don't own a high speed blender, I suppose you could try and use this technique to get the coconut butter ultra creamy before you add the rest of the ingredients, but I suspect the final result won't be nearly as spectacular. it was my question as well, can you substitute butter but with a coconut butter/oil? The ingredients/products that I link to are either those that I use myself of those that I would use if I had access to them. 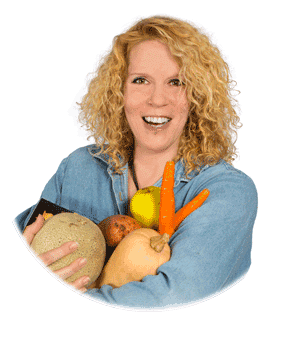 I’m in Canada so sometimes our selection varies, and not all products on Amazon.com will ship to Canada… Of course, I like to pick products that are better options for your health and for the planet, too! Can I use just the Fancy Shred coconut from Costco? The coconut flakes are pretty expensive. In western Canada the Costco shredded coconut is unsweetened and no sulphites, the brand is Sunblest. The flakes are sweetened, don’t know about sulphites in those. 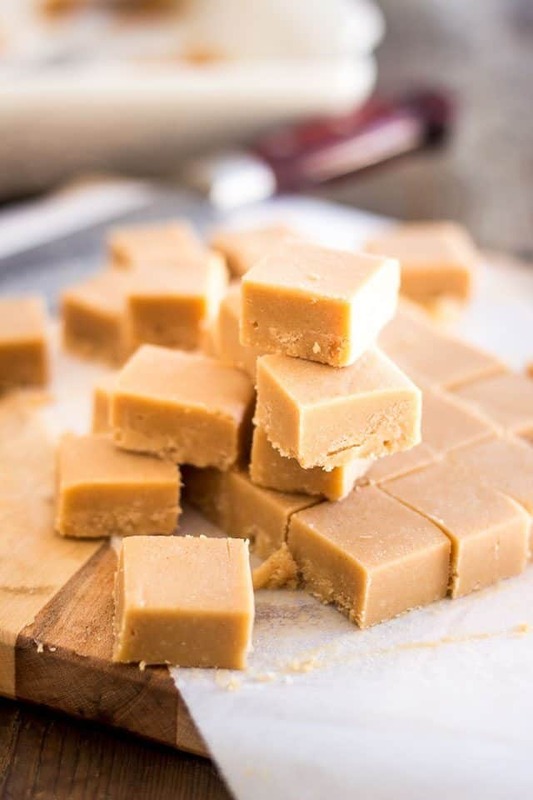 This fudge looks deliciously dangerous…on my list to make 🙂 Thank you Sonia for posting this! Ok, I was a little concerned about the Costco here then gone, so I picked up a bag to hide in the pantry – seriously this makes such good stuff I do need to hide it on myself! How much coconut butter do you end up with? I’m not sure I understand your question, Maxine… You mean before adding the other ingredients? When you have finished blending the coconut flakes, how much butter does it produce? Oh! Sorry, I didn’t really measure that since I wasn’t making coconut butter… 2, 2½ cups, maybe? 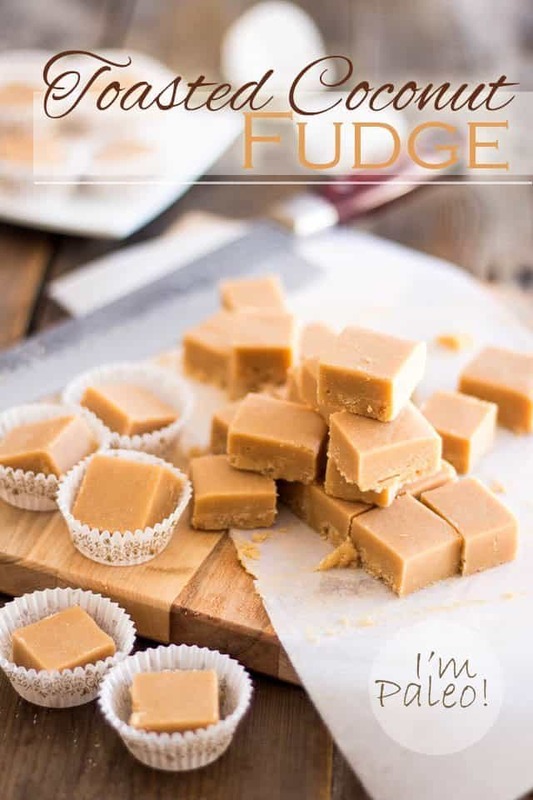 I looove fudge, and this looks perfect and looks like it has the exact right texture even without all the usual sugar. Can’t wait to try it out with my Vitamix (which I’ve had for over a year, and love every single day). Sounds heavenly, Alexandra! Love the addition of cardamom. Have to make a note and give that a try myself next time I whip up a batch! Thank you so much for that, Sharon! So happy to be an inspiration to you. Congrats on losing the weight and best of luck to you on reaching that goal of yours! You can totally do this! I’ve just ordered my Vitamix and I’m very excited!! 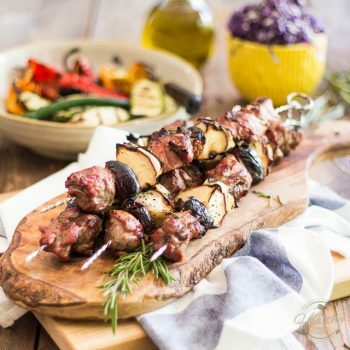 Just curious about this recipe which looks fabulous. Have you experimented with alternative sweetners? Like stevia. 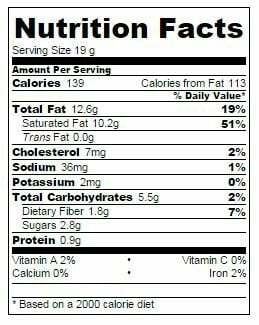 And what do you think about adding unsweetened cocoa. I love chocolate fudge too. I don’t know if it would mess up the recipe. I don’t really use artificial sweeteners, Cammie, and even stevia is a big no no for me. Besides, I just can’t stand the taste of it… Unsweetened cacao would probably be good in there, however, it might require the addition of a little bit more sweetness… Certainly worth playing with! Did you try making the smooth coconut butter first like I suggested, Crystal? Do you think it would come out if I use maple syrup instead of honey? Not sure, Jed… the final consistency might be a little bit on the softer side and I don’t know how well the flavors would mix. Might be worth a shot, though. Let me know how it turns out if you decide to give it a try! Would this still work if I add more honey time make it sweeter? 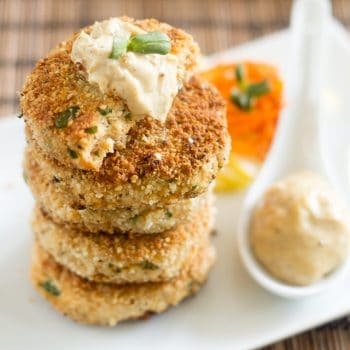 Want to make these again after so long. Can the raw honey be the runny one and not the hard raw honey? I’ve never tried with liquid honey, so I can’t tell for sure. Honestly, I think I’d stick with the firm, raw kind. Thank you so much. Busy trying it out now. I have the omni blend blender which is very strong. Taking me awhile to get smooth runny consistency. Does it take long to become runny? Ok maybe I added the butter too soon thats why it didn’t get runny.